Product and ordering information for Oil-free Non-chemistry Diaphragm Pumps. For non-corrosive, non-evaporative applications. Low maintenance & high reliability. Vacuum from 100-0.5 mbar. Free Air Capacity of 0.5-4.8 cfm. VACUUBRAND® Oil-free Non-chemistry Diaphragm Pumps are designed specifically for non-corrosive, non-evaporative applications. This line of aluminum-FKM diaphragm pumps are an excellent choice for a wide range of laboratory and process plant vacuum applications. These vacuum pumps utilize diaphragm vacuum technology. The totally dry operation eliminates the misting, handling and disposal of contaminated waste associated with rotary vane pumps. No oil to change or monitor! Typical diaphragm lifetimes are well in excess of 15,000 hours of use before replacement - that's years in most applications, minimizing downtime and service costs. When it is finally time for service, their unique design eliminates tedious, trial-and-error stroke length recalibration. VACUUBRAND® pumps are engineered for performance, with flow rates as much as 40% higher at working vacuum level than competitive pumps with similar free air capacity ratings. Higher flow rates mean reduced process times and higher throughput. 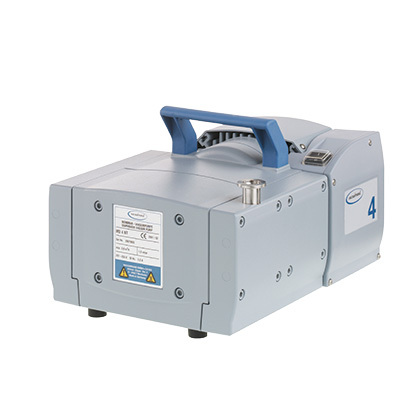 Use the MZ 2D NT (5 mbar ultimate vacuum) as a roughing pump for your high vacuum system, or as a standard workhorse for standard duty applications. For easy connection to standard vacuum tubing, order with KF DN 16 x DN 10 hose barb adapter (item #639758). *All pumps 120V, 60Hz unless noted. Dual voltage pumps require purchase of power cord. 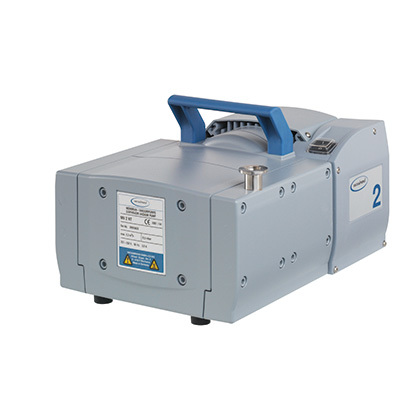 In general, our DVR2 gauge works well with nearly all of our diaphragm pumps. However, for four stage pumps (MV series), like the MV2 NT, or MV10C, the DCP3000 + VSK3000 will be able to register the deeper vacuum provided by these pumps. The DCP3000 + VSP3000 can also be chosen for the ability to mount the gauge head separately from the display or because it uses line current rather than battery power. 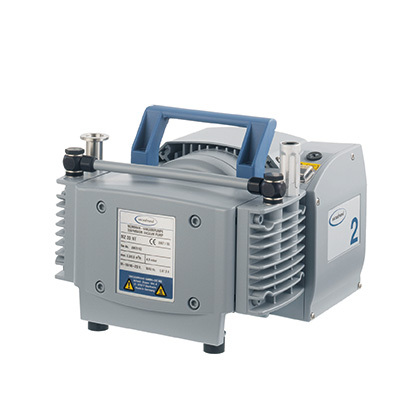 The DCP3000 + VSP3000 or VACUU-VIEW extended are excellent choices for rotary vane pumps and roots pumps. Unfortunately it is not possible to retrofit solvent recovery glassware to our pumps. However we do offer controllers that will work with your diaphragm or rotary vane vacuum pump, regardless of manufacturer. My application requires 27 inches of mercury. All your measurements are in millibar. What pump do I need? Relative inches of mercury is a unit that references atmospheric pressure, which literally is as variable as the weather. While accurate enough for fluid movement applications, it's a poor unit to use for most lab applications. Our Vacuum Pump Selection Guide contains a vacuum unit calculator that will convert these units, assuming standard atmospheric pressure of 760 torr. 27 inches of mercury translates to approximately 100 mbar. 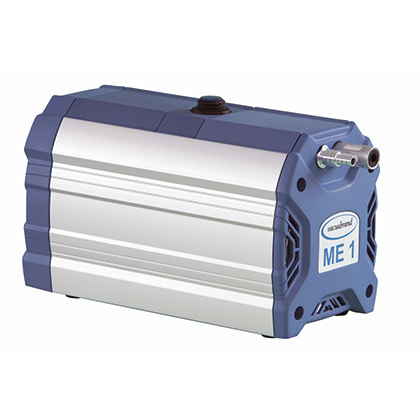 Our ME series single stage diaphragm pumps would be able to achieve that vacuum level. It depends. For certain applications, like freeze drying, diaphragm pumps can not achieve the ultimate vacuum required to perform the task. In these cases, we can suggest our low-maintenance RC6 chemistry-Hybrid pump as an alternative. However, for most laboratory applications, selecting the best pump for an application requires a bit more information that just telling which rotary vane pump you used to use, so that you don�t pay more than you need to, but get the correct accessories as well. Try our Vacuum Pump Selection Guide, or call our Customer Service department to get a customized recommendation for your application. What service kit do I need for my VACUUBRAND®-manufactured pump? If you don't see your pump on this list, call BrandTech Customer Service. Service kits - Sets of diaphragms and valves.